We are joined by NT Times Best Selling Author Kevin Kruse. 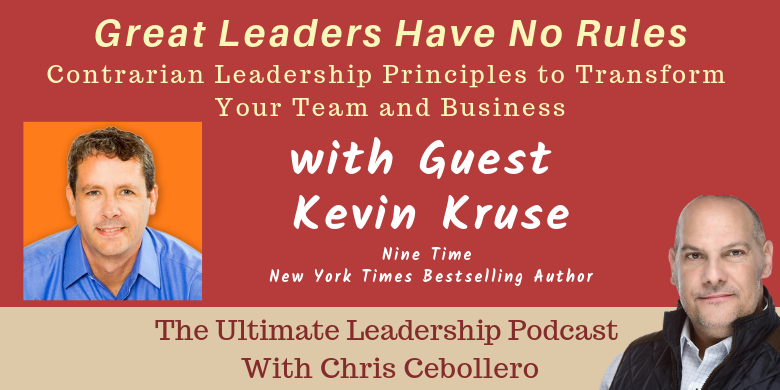 Kevin joins us to discuss his latest book, Great Leaders Have No Rules Contrarian Leadership Principles to Transform Your Team and Business out today.Kevin debunks the popular wisdom with 10 contrarian principles that will help you to develop a better, faster and easier leadership ability. Kevin Kruse is the Founder and CEO of LEADx (leadx.org), an AI startup that created “Coach Amanda”, the world’s first executive coach built with IBM Watson. LEADx has the mission to spark the next 100 million leaders around the world. Kruse is also a New York Times bestselling author, host of the LEADx Leadership Podcast, and previous winner of Inc 500 awards for fast growth and Best Place to Work awards for company culture. Attaining the Next Level; What gets You Promoted?